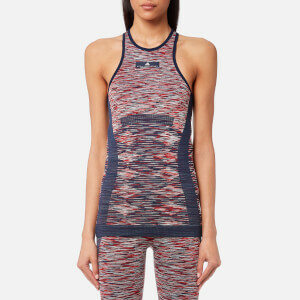 Women’s sweat-wicking, colour-blocked ‘Train Essential’ tank top with a ‘second-skin’ feel from adidas by Stella McCartney. Crafted from soft knitted Climalite yarns designed to keep you cool and dry during training, the top boasts a seamless design for ultimate comfort with breathable inserts and perforations for enhanced ventilation. A racerback silhouette with a crewneck and ribbed hem defines the stretchy top. Complete with a tonal logo patch on the lower back.